Batson Street, W12, 2007. Photo: © Jack Robinson. 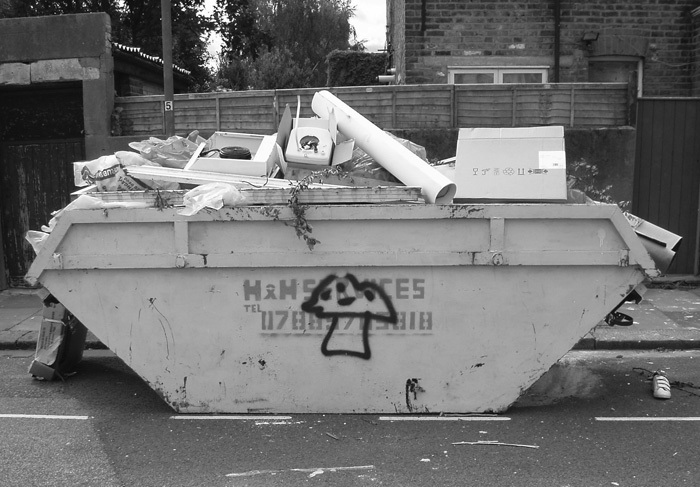 The white roll in this skip is not posters for a film that’s no longer showing or rejected samples from an advertising agency but drawings of a Macedonian girl who speaks almost no English but has a body to die for. The drawings were made by the American artist W. K. Teevald; during his month-long stay in London, where he’d come to supervise the hanging of a retrospective exhibition of his work, he checked out of his hotel and moved in with this girl, and he considers the drawings to be the best work he’s done for years. On the day of his return flight to Los Angeles the taxi he’d ordered didn’t arrive, so he loaded his bags into the only car available from the nearest minicab office. The drawings were strapped onto the roofrack. ‘No problem, mister, the Lord is good, he will take best care,’ said the driver as he yanked on the rope and knotted it. He looked about twelve years old and was grinning; he could have been making a joke, except that the Virgin Mary was stickered all over the dashboard and a crucifix dangled from the rear-view mirror. When they arrived at the airport the roofrack was bare: not even a shred of rope was clinging to the metal frame. The driver demanded twice the fare that had been agreed before they’d set out and followed Teevald into the departures hall, pleading for justice and if not justice then charity, until he was turned away by security guards.